MFC Fixed Plate Cloth Media Filters are designed to provide tertiary wastewater treatment following municipal and industrial activated sludge, extended aeration, SBR and other advanced secondary treatment processes. The filter operates entirely by gravity, requiring only small head differential, making it ideally suited for municipal treatment facilities located in low lying areas or industrial facilities which cannot accomodate large piping or hydraulic changes. MFC cloth media filters feature an innovative cloth media membrane of 100% acrylic material which removes even very fine suspended solids and TSS carry-over from secondary treatment processes. This fabric membrane is attached to multiple vertically placed media panels, each with its own internal framework, capable of handling significant fluid flow. Vertical media placement limits the filters mechanical footprint while allowing heavier or larger solids to fall to the bottom of the filter and not onto the media. MFC cloth media filters feature a unique 'fixed' or static panel design, which limits mechanical wear and maintenance. Problematic backwash manifolds or spray bars and associated pumps are eliminated by using differential head generated by incoming flow to the other filter 'cells'. Each filter contains multiple filter segments, each of which is backwashed in sequence during the backwash stage, all while influent continues to enter the filter at all times. Fully packaged filters are offered in 100% stainless steel and contain 100% non-corrosive internal components to limit maintenance requirements and increase equipment life. 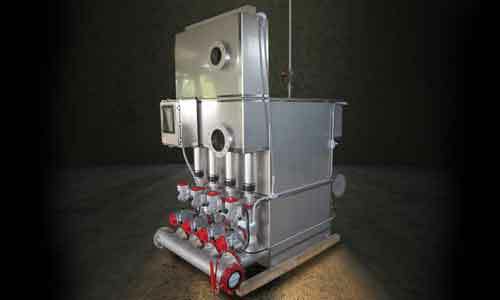 Influent and backwash valves are mounted at the factory and preprogrammed for optimal operation. A simple PLC based control system and small 2-3 HP compressor system is included to provide fully automatic operation. Modular systems are also available for installation into new or existing concrete tanks and are suitable for flows larger than 2 MGD.